Tour Grand Canyon, Optional Grand Canyon itinerary; Visit the luxury casino of Las Vegas; Visit behind the scenes of movie making, experience the magic of the movie world in Universal Studio; Visit world famous Disneyland or San Diego (Choose 1); Tour the international city of San Francisco, professional tour guide will introduce the scenery for you all day. Tour 5 major national parks, a glimpse of the colorful geothermal wonders of Yellowstone, beautiful mountains and rivers of the Grand Teton Park, majestic red cliff of the Bryce Canyon, sandstone Zion Park, magnificent view of the Grand Canyon Park; Visit the Salt Lake City Mormon sanctuary; Feel the luxury of Las Vegas, optional items for you to play. Sign up By clicking on "Sign up" above, you are agreeing to our User Agreement and Privacy Notice. Enter your email address below and we'll send you an email with a verification code to reset your password. Please enter your new password and verification code we just sent to your email address. 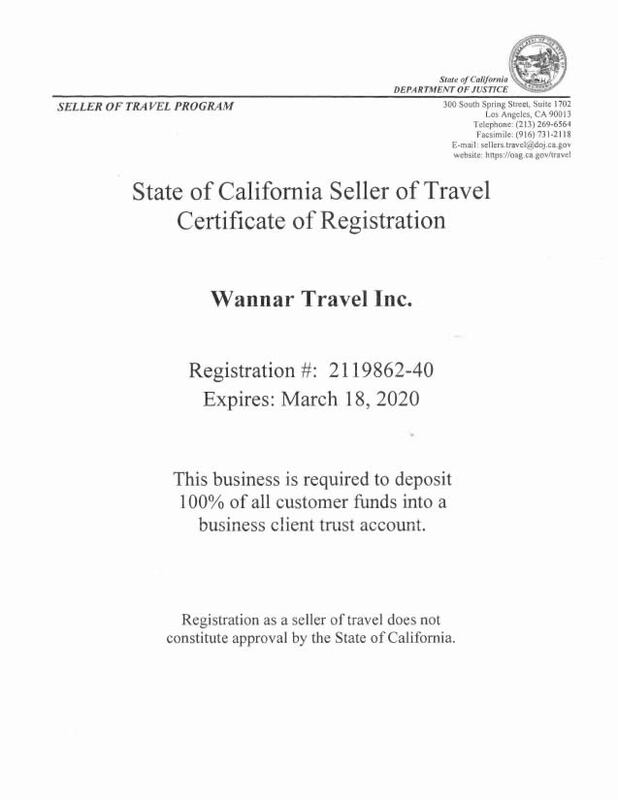 Copyright © 2017 WANNAR Travel INC. All Rights Reserved.